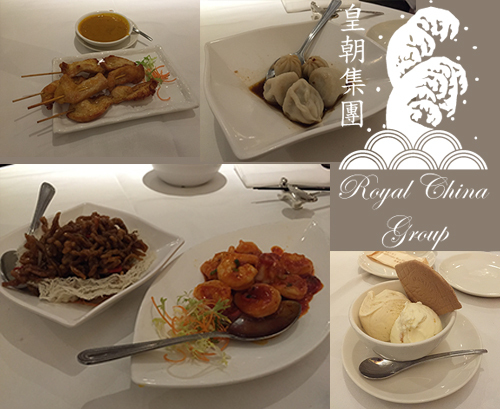 Since launching in 1996, The Royal China Group has become an award winning chain of restaurants, based in Baker Street, Queensway, Canary Riverside, Fulham, Harrlow and the luxury Royal China Club (also on Baker Street). I went along to visit the Baker Street venue and to check out the food on offer! To start we enjoyed Satay Chicken and Steamed Chilli Pork Dumplings and then for the main course Crispy Shredded Beef served in Birds Nest and Sauteed Prawns with Red Chilli Sauce ‘Szechwan Style. Feeling rather stuffed after that, I didn’t think I could quite fit in a desert but when I saw a list of Award Winning Asian Ice Creams, I couldn’t resist giving them a whirl. I had Vanilla and Stem Ginger and they were glorious, the highlight of my meal and something I would definitely go back for! This large restaurant is bright and airy with staff pottering around (although catching their attention was a little difficult at times). The food was enjoyable although perhaps not the best Chinese food in London (the Satay was a little bland and the the Chilli Beef a little dry). If you’re in the Baker Street area and looking for a laid back environment where you won’t be constantly pestered by staff then this is an option for where you could go. I would go back just for the ice cream but probably not for the entire meal. Do eat each dim sum dumpling in one go to get the full flavour of the components in your mouth. It is also less messy! Do drink tea with dim sum and never order other hot drinks such as coffee as it can overpower the taste of the dim sum. Tea is the most important factor when eating dim sum, and we recommend ordering Jasmine or Chrysanthemum tea. It is best to drink the tea with fried or baked dim sum to wash it down and cleanse the digestion system of the oils. Do always pour others tea before your own as this is tradition in China. Do tap your index finger on the table to thank the person pouring the tea. This is a recognised symbol of “bowing” in China and was invented by an emperor. Do order a lot of different dishes and share between the table for a variety of flavours. When eating dim sum order rice as it is a good way to cleanse your palate. Don’t use your own chopsticks to serve yourself from the communal bowls. Don’t save dessert until last. It is acceptable to request a dessert dish in the middle of the meal such as Egg Custard Tarts. As the tea freshens your palate diners can mix sweet and savoury dishes. Don’t eat dim sum cold, it needs to be eaten hot. It should not be left to cool and it should be eaten within 15 minutes of being served. Start with fried dim sum then steamed as the fried dim sum cools quicker. Royal China serves dim sum in steam baskets with a lid to preserve the temperature.